Nishit leads Dastur's business development initiatives in North America and supports project delivery services globally. With over 6 years of expertise performing techno-economic studies, operating cost and financial modelling, and analyzing and benchmarking costs for clients, he has worked across all phases of the project lifecycle, from feasibility and scoping studies to commissioning. Previously a consultant at Hatch, Nishit assisted in assessing investment opportunities for metals & mining clients. He has publications in the areas of mining, iron-making and steel-making, with presentations at a number of conferences including SME CTMF (New York), ECIC (Austria), METEC (Germany), AISTech (USA) and ABM (Brazil). 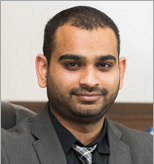 Nishit is a member of AIST, MetSoc of CIM, OSPE and PEO. He completed his BE & ME in Chemical & Bioengineering, McMaster University, Canada. His active involvement in the technical community won him an Emerging Professional award from the Canadian Institute of Mining & Metallurgy, as well as being included on a list of the Top 150 alumni from McMaster University's Faculty of Engineering.